I am probably years behind the trend of making salted caramel. But until this weekend I really had no reason to make salted caramel. I was also not sure how it would work with fructose and so I have really not bothered to make it. Now that I have, it will always be in my fridge. 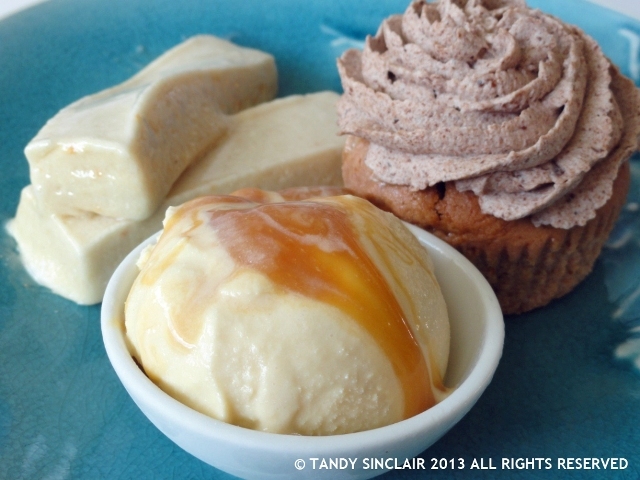 Salted caramel making needs patience – something I am short of. But as I had so many other things to make this weekend, I could leave the fructose on glucose on the stove to do it thing while I measured out the ingredients for the other recipes I was making. I love the salt aspect of the caramel as it cuts through anything that is overly sweet. I left it in the pot overnight, out on the kitchen counter as I did not know if it would harden or not, and I was pleasantly surprised when I discovered that it had remained runny. I caught Dave lifting the spoon out of it a few times – he caught some of the dripping salted caramel off the spoon and taste tested it often during the evening. I used my salted caramel in an ice cream (recipe to follow) and it adds such a wonderful dimension. I put a small jar into the fridge and if it is still there when we get back from overseas I might try and make a cake with it. Are you a salted caramel fan? I think it is going to be a favourite for me as well! You make it sound so easy! I’m always worried I’ll overcook it! I am going to add this to the recipe list, I love salted caramel! I too am a bit behind on this trend! Looks fabulous though!! Given how easy this is, I am going to make more! I only recently tried this for the first time and loved it – am going to give this a go! I love salted caramel, but definitely do not make it enough! I had no idea how easy salted caramel was to make. Thanks for posting Tandy! Always so nice when a recipe works out so well, especially when using substituted ingredients. Have a wonderful trip Tandy.